Bethesda Game Studios has brought Elder Scrolls: Skyrim VR to PC, giving players yet another chance to take up the mantle of Dragonborn. At this point, most of you have had countless adventures in the snow-capped region of Tamriel, but thanks to the increased immersion and visual depth brought by virtual reality, Skyrim feels new once again. One can’t help but compare this release to Fallout 4 VR, Bethesda’s latest VR offering, which was held back by blurry visuals and some clunky mechanics. With Skyrim VR, these issues have been fixed for the most part. Gone are the blurry vistas and distant objects. In fact, I want to know what sort of black magic the developers had to perform to get mountains miles away in the distance to look crystal clear. 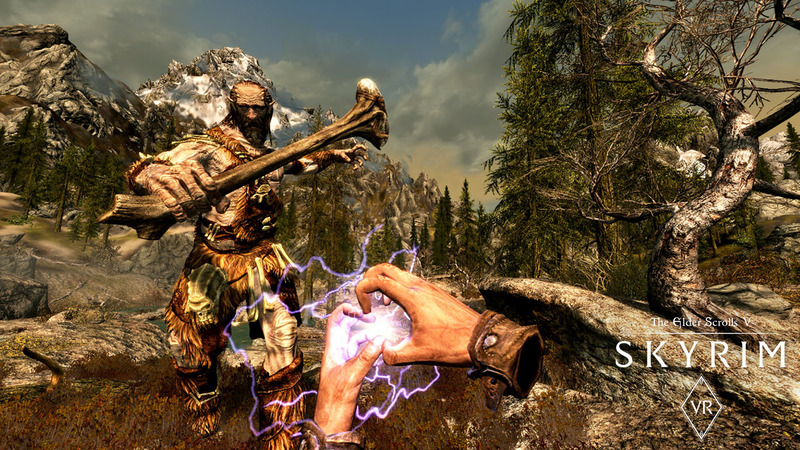 In general, VR titles have always struggled with a lack of clarity in background objects due to the screen being smushed up against your face, but you wouldn’t know it playing Skyrim VR. Although it’s a title from 2011, the world is gorgeous in virtual reality, with landscapes ranging from serene riverbanks covered in shrubbery to foreboding mountain caves. Dungeons and building interiors are perhaps the most breathtaking in VR; in caves, little details like floating dust particles come through crystal clear in the headset and do wonders for the atmosphere. As for buildings, the spatial depth will have you staring up at the ceilings and marveling at the cathedral-esque height inside places like Dragonsreach. NPCs are also more fun to talk to, as they have much more presence this time around. Of course, the stars of Skyrim are arguably the dragons, and they’re as intimidating as you could hope for. Being engulfed in flames by a dragon that landed right next to me induced a sense of panic I never experienced in the vanilla version. As enjoyable as virtual sightseeing is, the title would be a waste if the combat were mediocre in VR. I was pleasantly surprised to find that combat feels almost like it was designed for VR — at least for archers and magic users, who will have a blast. Physical fights, on the other hand, feel a little too weightless and whack-a-mole-y, as you frantically swing through the air with little physical feedback. There are few things more satisfying than riding on horseback at full speed and hitting a fox from a decent distance on your first try. Holding a bow with your left hand and rapidly notching and firing arrows with your right hand feels natural (assuming you enable realistic archery in the options menu). In vanilla Skyrim I never played around with spells that much, but I’m more inclined to use it in VR because seeing lightning emit from my hands makes this title the Emperor Palpatine simulator I never knew I wanted. Like Fallout 4 VR, the heavy reliance on navigating menus doesn’t lend itself to VR particularly well. (Especially with Vive’s less-than-precise trackpads.) I often got tripped up and pressed the trigger over items I wished to add to my inventory, which equips said item rather than merely adding it. The jump button being mapped to the left-hand grip also feels fairly unnatural, which is troublesome considering the verticality of Skyrim’s world map. Finally, the only other gripe I have with the controls is that horseback riding feels strange, to say the least, and dismounting your horse is finicky, causing me to pretty much forego that method of transportation. Presentation-wise, I’m happy to report that Bethesda has put some attention towards making the title feel natural for VR. The first and best example of this is that upon starting the title for the first time, you’re treated to a tutorial which teaches you how to teleport and what comfort options you have. Of course, for the most immersive experience, you’ll want to turn on smooth locomotion, but it’s nice to see that additional content was actually created for this port, albeit a minor amount. It’s a testament to Skyrim’s design that even elements that are hardly changed by VR (such as the loot system, crafting, and other miscellaneous tasks that you can sink hours into) are still fun in 2018. 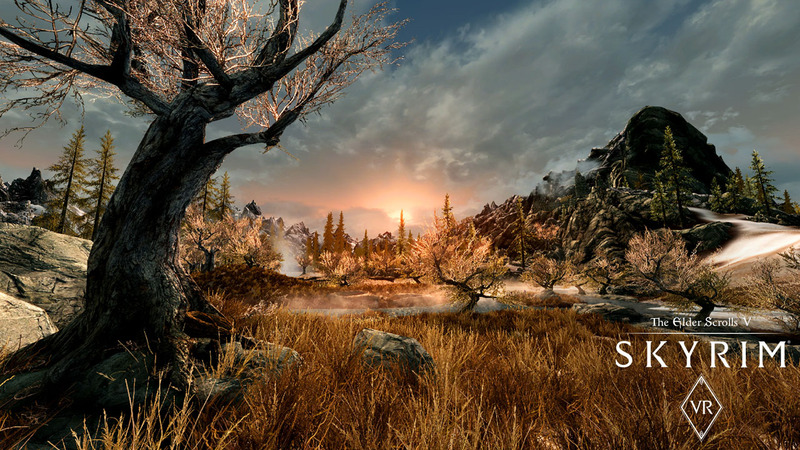 Your mileage with Skyrim VR depends mostly on how much you enjoy the original title. Flaws such as some frustrating-to-navigate mountains, or fetch quest-y missions are still present today, but so is everything that made the original title great. On top of that, many mods (unofficially) work with the title after some troubleshooting. I’ve yet to try this out, as I wanted a vanilla experience for the review, but I look forward to pushing the title to its limits. Speaking of which, the performance was flawless throughout my time with it. On an SSD, load times take about one second, and there were no stutters, frame drops, or crashes, which is more than can be said for Bethesda’s previous VR port. It’s not too surprising given my setup, but I’ve read that the title runs perfectly on less stellar hardware as well. Skyrim VR translates one of the most entertaining RPGs of the previous generation to virtual reality with next to no hiccups along the way. In a sea of glorified tech demos that last two hours tops, it’s nice to have a content-rich fantasy world option that could easily last players 100+ hours. Though there are a few minor irritants, such as the overuse of menus (an inevitability in a title like this), the core experience is ludicrously fun and runs like a dream.